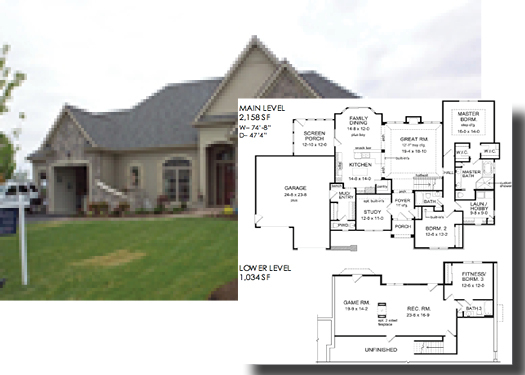 If you’re looking to build a custom home that will meet your needs now—and well into the future—you may want to take a look at a floor plan that offers great single-level living, with extra room if your need it. Our Wyndham model may be just what you’re looking for. If your family has older children (who will eventually be moving out after a few years), this plan makes a lot of sense. In addition to the Master bedroom on the 2,158 square foot main level, there’s a second bedroom. And if you need extra sleeping space, you can finish the 1,034 square foot basement with a third bedroom that can later be converted to a fitness room—or simply become a well-appointed guest room. There’s even a third bathroom in the finished basement. Whether or not you need the space on the lower level, the main level has lots to offer. The Master bedroom comes with two walk-in closets and it’s own master bath. Having the laundry room located on the main level eliminates the need to carry laundry up or down stairs. The main living space offers easy access between the Great Room and the open kitchen and dining rooms. There’s even a study/home office on the main level. Plus, you can escape outside onto the screened porch off of the dining room when the weather is nice. The 2-car garage opens into a mudroom entryway with space to store your stuff (and keep dirt out of the house. This is a great floor plan for families in transition. There’s plenty of space now—and the plan allows adults who want to remain in their home to enjoy one-level living for years to come. Take a closer look at a detailed floor plan here. If this plan isn’t perfect for your family, we have plenty of other options from which to choose. Check back regularly for highlights of additional plans!